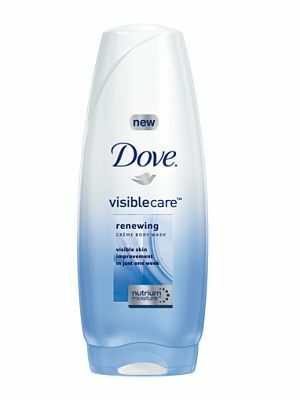 Better skin from a body wash sounds too good to be true, but that's just what Dove's new VisibleCare Renewing Creme body wash ($5-7 in drugstores) promises. Boasting a high concentration of NutriumMoisture--Dove's trademark moisturizing complex--this product supposedly makes skin softer and smoother within a week, with full results visible in three weeks. These are very tall claims for a drugstore body wash, so it was with considerable curiosity that I requested a bottle for review. So did it live up to the hype? Yes and no. To fully test out its claims of better-looking skin, I stopped using body lotion so that any benefits could be attributed to the body wash alone. (Oh, the things I do for this blog!) After a week, my skin wasn't as dry as it would've normally been sans lotion; that was a pleasant surprise. But after three weeks, my elbows, knees, and legs started to look ashy and scaly. My skin felt drier to the touch and I resumed applying lotion post-shower again. The VisibleCare Renewing Creme Body Wash wasn't a complete disappointment though. It has a creamy texture and the richest lather out of any body wash that I've ever tried. In fact, the lather is so rich that a little goes a long way and the 300 ml bottle will last quite some time. The scent is a nice clean soapy smell--nothing gourmand or fancy, but very pleasant and fresh in its own right. It's a good body wash for the price point, and once my review bottle runs out I'd definitely consider purchasing a replacement bottle for myself. Have you tried Dove's newest body wash? What do you think of it?